When you have a dog, poop happens. Being responsible pet parents means we need to carry potty bags to clean up after Lacey when she does her her business outside and on walks. Being the green minded people that we are, I keep and fill two grocery bag holder for the stray plastic bags that cross my path. I keep the empty grocery bag holder hanging in the kitchen to fill with random bread, frozen vegetable, and the occasional plastic grocery bag when I forget my canvas grocery bags when running a quick errand. When it is full I swap it out with the grocery bag holder I have hanging in the closet by the front door so we can reuse the bags for doggie duty. 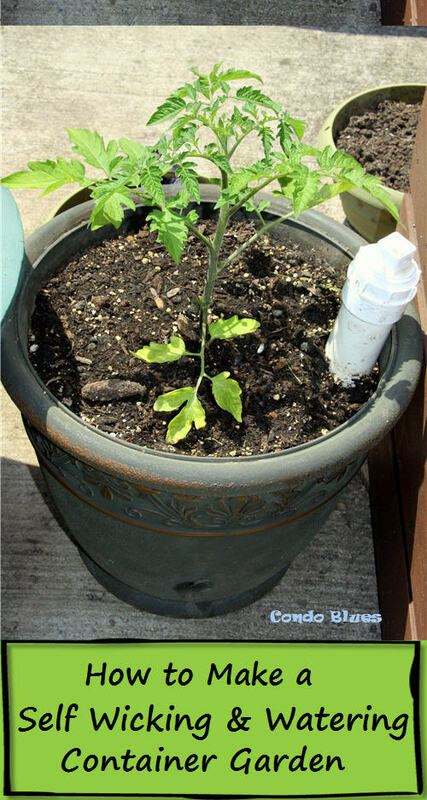 It isn’t perfect green solution but it works for us. The big grocery bag dispenser in the closet is too big to take with us on walks. I sewed a small plastic grocery bag holder that attaches to Lacey’s leash to fill with repurposed bags from hall closet holder. 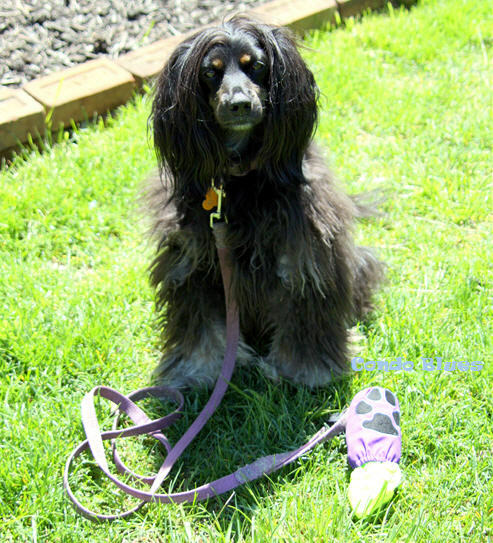 The purple fabric I wanted to use matched Lacey’s purple leash and a little too plain. 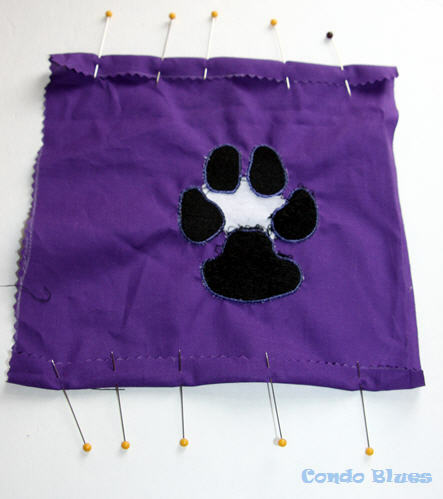 I jazzed it up by machine embroidering a dog paw on my leash bag organizer which is a fantastic beginner machine embroidery project! If you don’t have an embroidery machine, try sewing this project using cute fabric instead. Follow me @condoblues on Instagram to see work in progress project photos like this in real time! 2. Using the sewing gage, turn over the top and bottom edges of the waste bag holder by a 1/2 inch. Use the straight pins to pin it into place. 3. 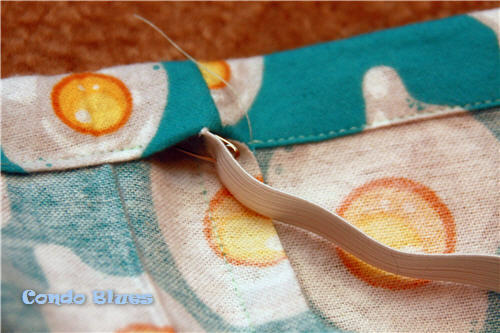 Use the sewing machine and sewing thread to sew the channels for the elastic into place. Tip: Remove the straight pins as you sew! Sewing over straight pins is an excellent way to break your sewing machine needle. Guess how I know? 4.Attach the safety pin the end of a piece of elastic and use it to thread the elastic into the channels you sewed in Step 3. Use a straight pin to pin the ends of elastic in the channel. I always use safety pines to thread elastic into clothing waste bands and such. So easy! 5. Pin hook and loop tape to the side seam of the fabric with the hook and loop tape with the back of the loop tape on top of the hook side of the hook tape to the right side (the pretty part with the embroidery on it) of the fabric. The majority of the hook and loop tape should be pinned to the right side of the fabric. This will make the hanger that attaches to your dog’s leash. I took this photo on the unhemmed dog bag holder so you can see how to and where to pin the hook and loop tape in what will become the side seam of the dispenser. 6. Use the straight pins to pin the length of the ride sides of the fabric together to create a tube and use the sewing machine to sew the fabric in place. 7. 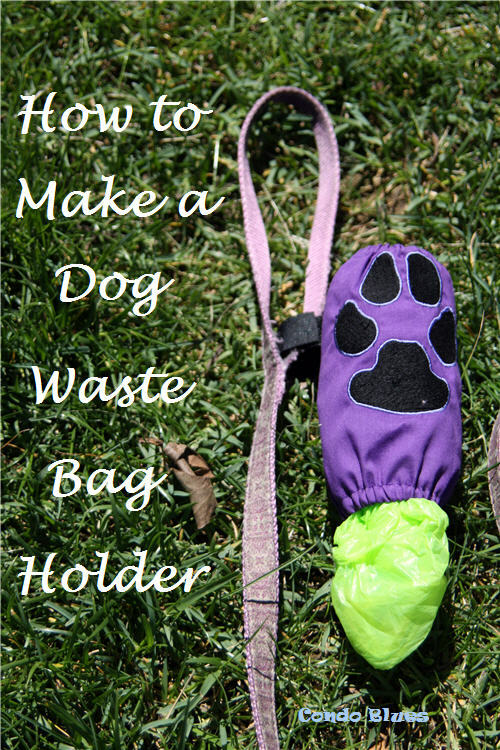 Turn the dog potty bag organizer right side out. 8. 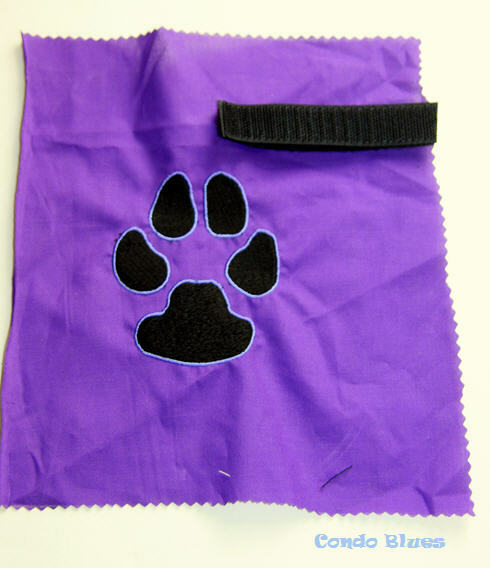 Use the hook and loop tape to attach your dog waste bag dispenser to your dog’s leash, fill it with empty plastic bags, and clean up! Enough with the photos! Let's walk!